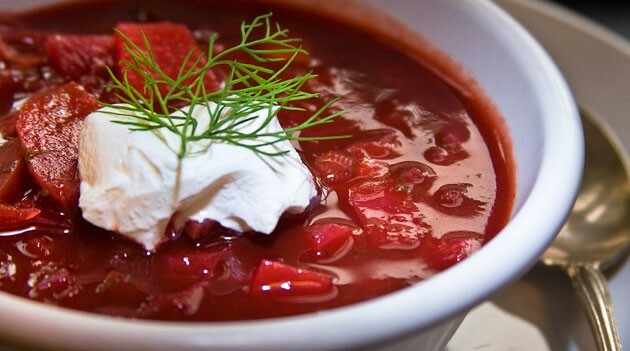 Borscht: This is a staple comfort food in many Jewish households; and healthy and delicious too. Everybody knows that cooking varies from country to country. There are Italian restaurants, Chinese restaurants, etc. We associate different styles of cuisine with different languages. Do we also think of the association of different cuisines with different dialects? We should, because cooking also varies from region to region. Litvaks and Galitsyaners have their own traditions of preparing gefilte fish. Marvin I. Herzog, in his book The Yiddish Language in Northern Poland: Its Geography and History (Indiana University, Bloomington, and Mouton & Co., The Hague, The Netherlands. 1965) offers us the following information: “The custom of preparing fish as a Sabbath delicacy dates at least to Talmudic times, and is universal in our area. However, sweetened fish, also called poyliše fiš “Polish fish,” is generally unpalatable to those east of the border, who prefer their fish seasoned only with pepper” (p. 18). He includes a map, Figure 2.1, on page 19 showing us the boundary line between gefilte fish with and without sugar. My interest in languages and dialects led me to discover the regional variations in East European Jewish cultural traditions that Herzog mentions. My daughter Eve, who is a baker and a cook, in addition to being a Yiddish teacher, is the translator of a vegetarian cookbook by health-conscious Fania Lewando of pre-WWII Vilna, called The Vilna Vegetarian Cookbook: Garden-Fresh Recipes Rediscovered and Adapted for Today's Kitchen by Fania Lewando. Its 400 recipes range from traditional Jewish dishes (kugel, blintzes, fruit compote, borscht) to vegetarian versions of Jewish holiday staples (cholent, kishke, schnitzel) to appetizers, soups, main courses, and desserts that introduced vegetables and fruits that had not traditionally been part of the repertoire of the Jewish homemaker (Chickpea Cutlets, Jerusalem Artichoke Soup; Leek Frittata; Apple Charlotte with Whole Wheat Breadcrumbs). Accompanying the recipes are lush full-color drawings of vegetables and fruit that had originally appeared on bilingual (Yiddish and English) seed packets. Lewando's cookbook was sold throughout Europe. Eve cites Herzog when discussing the recipes in the book. In her discussion of Fania Lewando’s recipe for toasted farfel porridge, she paraphrases Herzog by telling us, “Chopping would have been the method for making dough into farfel in Fania’s Vilna. In other parts of the Yiddish world, traditional methods of farfel preparation included cutting, plucking, and grating the dough” (pp. 87-88). Eve’s interests led her to earn a doctorate in culinary ethnography. Now she has finished translating this cookbook, originally written in Yiddish. Interestingly, it was necessary to know both Yiddish and culinary ethnography to do this translation. On June 2, there was a celebration of the book’s launching at YIVO, located in New York’s Center for Jewish History. The following day, Eve participated in a discussion of Lewando and her work at New York’s Tenement Museum. During these events, we learned about the popularity of Lewando’s restaurant in Vilna and about how innovative her recipes were. Lewando included recipes from different Yiddish-speaking areas as well as from cooking traditions of other communities. She also invented her own dishes. I was delighted to taste blueberry soup and cabbage cake for the first time in my life. Lewando was interested in health and in vegetarianism, two subjects that are connected. She wanted to improve the world by creating and spreading healthy vegetarianism. The book contained impassioned essays by Lewando and by a physician about the benefits of vegetarianism. Lewando wanted to make history. For a brief while, it seemed she was making history. The restaurant owned by her husband, Lazar Lewando, and operated by Fania, was respected as no kosher restaurant in Eastern Europe had ever been. It was not your ordinary dairy restaurant. It was a place that appealed to writers, artists, and intellectuals. Famous people signed their names in the guest book. Among them was Marc Chagall. It was the wave of the future. The world was ready for a new and sophisticated vegetarian haute cuisine, and Fania Lewando was providing exactly what humanity was looking for. Alas, a different aspect of history unmade her and her plans. Her cookbook first appeared in 1938, a year before the outbreak of World War II. She and her husband were unable to flee to the Soviet Union, where some other Jews managed to escape and survive. Her dreams of a new and healthy vegetarian world were lost—at least at that time. But in 1995 a couple attending an antiquarian book fair in England came upon a copy of Lewando's cookbook. Recognizing its historical value, they purchased it and donated it to the YIVO Institute for Jewish Research in New York City, the premier repository for books and artifacts relating to prewar European Jewry. Enchanted by the book's contents and by its backstory, YIVO commissioned a translation of the book to make Lewando's charming, delicious, and practical recipes available to an audience beyond the wildest dreams of the visionary woman who created them. Now that her book exists in an English translation, and now that the world is more health-conscious and interested in vegetarianism than ever before, maybe her dream will be realized through this translation. George Jochnowitz was born in New York City, in 1937. He became aware of different regional pronunciations when he was six, and he could consciously switch accents as a child. 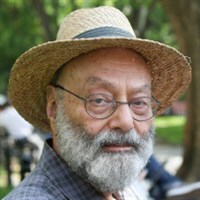 He got his Ph.D. in linguistics from Columbia University and taught linguistics at the College of Staten Island, CUNY. His area of specialization was Jewish languages, in particular, Judeo-Italian dialects. As part of a faculty-exchange agreement with Hebei University in Baoding, China, he was in China during the Tiananmen Massacre. He can be reached atgeorge@jochnowitz.net. Copyright ©2015. George Jochnowitz. All Rights Reserved. This review originally appeared in Arutz Sheva (June 29, 2015) and then in the algemeiner (June 30, 2015). It is republished here with the author’s permission.